1. Which paint should I choose? 2. What sheen should I choose? 3. What color should I choose? 4. What type of look am I looking for? 5. What color should I put on the ceiling? 6. Do I want a focal point? Painting is a quick and inexpensive way to change the look of your room. If it is feeling tired and out of date, a fresh coat of paint can change the whole look and feel of your room. When choosing a paint there are a few things you may want to consider. What paint should I choose? 1. There are two types of paint, oil or latex. •	Latex is the most commonly used and preferred paint type because it cleans up easier and has long lasing durability. Latex paint also tends to be more fade resistant. Latex is the most commonly use paint for household walls. •	Oil paint is great for priming real wood, moldings & trim. It tends to seal stains & knots from the wood better than latex paint. But it does take longer to dry than latex paint. What sheen should I choose? The type of sheen you use may depend upon the room you are painting. For example, if you are painting your kitchen, play room or a room that tends to get dirt, grease or smudges, you may want to use a high gloss paint as it is easier to clean up. This will allow you to wipe the walls down with a damp sponge. But keep in mind, a higher gloss paint will also show the imperfections in your walls. You could also use a semi-gloss paint in rooms that need ease in cleaning as well. It does not have as much shine as the high gloss paint, but it may be slightly cheaper and gives you another option. Semi-gloss paints are also a good choice for kitchens and bathrooms. A satin sheen gives you a satiny finish. This is a good option of you want some gloss with easy clean up without the shine of a gloss paint. Satin sheen paints can be used in kitchen, baths or hallways. A popular paint that hides imperfections, like the flat, but is easier to wash is an eggshell finish. This is a popular finish as you get the best of both the flat and glossy finishes. Choosing a paint color is a definite challenge as there are hundreds of colors to choose from. You can change the feel of any room with by changing your paint color. You may want to think about the type of look you are looking for in your room. If you are looking to sell your home, you may want to consider choosing white or off-white. This allows the buyer to easily cover the walls with a color of their choice which also gives the room a bright clean look. However, since there are so many color choices to choose from, if you are looking for a certain look for feel, you may want to talk with a salesperson at your paint store for other options. You may also want to think about the color wheel we learned about in school…red, yellow and/or blue. These are on the color wheel at 12:00, 4:00 and 8:00 respectively. In combining any of these colors you will get a secondary color such as purple or orange. Color near each other on the color wheel such as blue or purple are similar to each other and will allow one color to stand out more than the other. If a color is opposite each on the color wheel such as green and red, you will notice they compliment one another and play off each other nicely. If you stay within the same shade of a color, such as greens, you will notice a subtle and soothing look. If you like cool colors such as blues, greens and purples, you will notice the room appears larger and has more of an airy look. However, colors such as reds, yellows and oranges will give your room a more vibrant look. You can vary the warmth even with reds or yellows cy choosing a muted shade such as pink, peach or a buttery yellow. Warm colors have cool ones as their complementary color while cool colors have warm complements. Shades are either pure or vibrant, muted (which are less intense) or shaded (the darker colors in the same color scheme). I want a subtle and soothing look. You can choose to stay within the same shade and use a monochromatic approach such as select a variety of shades of blue for subtle color that tends to be soothing. This tends to look good in a bathroom or bedroom if you want a calm feeling. Just choose a color and overlap the shades. For example, if you choose a darker color for your walls, you could choose the same color in a slightly different shade and slightly lighter for the trim. You can also layer colors by selecting a lighter green as your basecoat then do a faux paint with a darker green overlay. Lighter colors such as blues, lavenders, pinks and soft yellows are great for a romantic and restful feel. If you are looking for a calm feel in your bedroom, choose lighter shades of either wool or warm colors. Colors such as sage can give your kitchen a feel of comfort, while a buttery yellow will give you a feel of baked goodies. Shades of powdery blue will give you a feel of tranquility. Neutral colors will give you elegance and flexibility in your space. Neutral colors are no longer simply white or beige. You can turn your living room into one of elegance by selecting varying shades of neutral colors. For example, you can choose almond as your wall color and ted toned browns on your trim. Then you can add splashes of color throughout your room with color in a throw, pillow or vase which is placed to off set the subtle neutral tones in your room. Don’t be afraid to add texture to your accessories. Neutral colors will allow you more flexibility in changing the feel of the room quickly. It’s easily to change the feel of a neutral room just by adding different colored accessories or even painting the trim a new color. You can choose either lighter or deeper neutral colors and vary the look of the room. But, remember, the lighter color you go, the more spacious the room will appear. Varying shades of rust, mahogany or garnet will offer instant elegance and a feeling of earthiness and richness. If you want your room to have pizzazz, choose vibrant colors and their respective shades such as oranges and gold, reds and dark purples. These colors are complemented by selecting two next to each other such as gold and orange and one from the opposite side of the color wheel such as purple. If you select black and red for a real stand out contrast and that will give you a look that is reminiscent of an Oriental look. Choose two colors next to each other on the color wheel for a visual contrast as one will stand out from the other. You can actually lower a high ceiling visually by painting it a darker shade than your walls. You can also expand a room by selecting a lighter color for your ceilings than your walls. Don’t be afraid to add a tint of color to your ceiling paint for a tied in and subtle look. If you are afraid of too much color on your ceilings, try painting your ceiling, door trim and floor molding the same shade. This will give you a touch of elegance with a nice transition throughout your room. You can quickly change the look of your room by adding a focal point by using contrasting colors on the wall and trim or by adding a darker color to one wall. A large room will look smaller by painting one wall a darker shade. You can also visually expand your room by painting the walls a darker color and the trim a lighter shade within the same color scheme. This is especially true if you have detailed trim on your walls. This easy change will make your room pop out visually and add definite appeal to your room. If you have a room with molding halfway between the ceiling and floor, use two different shades of the same color for a wonderful visual contrast. You can also highlight an interesting feature in your room with a darker, complementary shade to the one you have chosen for your walls. Visible stairways, especially those in the middle of the room look incredible when painted a darker shade than the walls which will also give you a wonderful focal point. You don’t have to spend a lot of money or hire an interior designer to redo the look of your house. A little paint and imagination can easily change the look and feel of a room. Look for the highlights of your rooms and think of ways to make them stand out. Think of how you want to feel when you are inside that room. If you want to feel romantic or calm, you may want to choose a light warm or cool shade. If you want to feel homey and comfortable, you may want to select buttery shades of yellows. If you want a feel of calmness and balance, you may want to choose shades of green that are light or moss or sage colors. If you want to feel energized expressing your vibrant personality, choose vibrant shades. If you want an air of elegance and serenity, you may want to select neutral shades or cool light greens. Just remember, you can quickly change the way you feel in your room with a can of paint or two, a paint brush and little imagination. Now that you have chosen the color or colors for your room, you will also need to choose the right tools for painting your walls. FOAM BRUSHES: These are work well for intricate work, such as painting molding or window casings. These brushes are normally good for only one use as they are hard to clean and easy to tear. MANMADE BRISTLE BRUSHES: These brushes are used for acrylics, water-based and latex paints. Before you buy a manmade bristle brush, make sure it has a thick head of evenly distributed bristles. Cheaper brushes may have caps in the middle of the head of the brush. POLYESTER SYNTHETIC BRUSHES: These are available with straight bristles or split-end bristles. Split ends give good coverage so few strokes are needed to paint a surface. These brushes are usually used with latex paints. NATURAL-BRISTLE BRUSHES: These are made with animal hair and usually used with oil-based paints. Latex and water-based paints will dry out the bristles. FOAM ROLLERS: When used with latex paint, a foam roller will give a finish similar to the finish of a paint sprayer. Foam rollers also come in the shape of a wheel, allowing the user to get into corners easier. As you know, a can of paint can completely change the look of a room, and it won’t cost you an arm and a leg. But the question is, what kind of paint gives you the most for your money? The cost of a gallon of paint can range from less than $8 to more than $30. Are the most expensive paints really worth the money? One factor that will affect the cost is the type of paint…alkyd oil-based or water-based latex. Even though alkyd oil-based paints are more durable, they can be more difficult to work with and to clean up. It also takes longer to dry and clean up requires turpentine or paint thinner (mineral spirits). Oil-based paints are made with either alkyd (synthetic) or linseed (natural) oils. 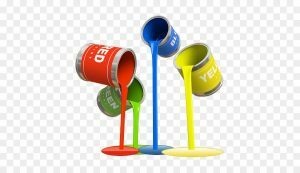 Alkyd paint is more common because it is less expensive and tougher. The question that is commonly asked is, “what is the difference between a $30 can of paint and an $8 can?” First, it’s the amount of work it takes to apply the paint. The higher grades of paint contain titanium, which gives the paint more coverage wo it does a better job of concealing the surface it is covering. The cheaper paints contain little or no titanium, relying instead on clay. As a result, it may take three or more coats of cheap paint to equal the coverage of one coat of high-quality paint. When applied by paintbrush, the cheaper paints will show brush marks and provides poor coverage. The Higher-quality paints provide a smooth one coat coverage. The more expensive paints also offer a big difference in durability which will give you more of a washable surface and greater scrub resistance. If you try to wash dirt off of a cheaper paint, you may also wash off some of the paint. A higher quality paint also reduces the tendency to splatter. They contain an anti-splattering agent that produces less mess than a less expensive paint.